Now my question is - why face the trouble? Why would I prefer a carbon steel kitchen knife over a stainless steel one? Carbon steel is more malleable and less brittle than stainless steel. This means that it is easier to hone on a knife steel, to maintain an extremely sharp edge. Some folks feel that the benefit of that sharp edge–for example, in easily slicing tomatoes, and other very fast prep tasks–is worth the compromise of more persnickety maintenance. Lots of opinins but not much metallurgical knowledge.....reminds me of hotroders thinking something is better if its made out of billet instead 6061 AL (same thing). Where's that crazy smilie? Hardening means heating it past the critical tempurature (roughly red hot) and quenching it (differently mediums for different alloys, ie water, oil, air). After hardening, the steel is 'tempered' which means its reheated to a much low temp to 'let down' the steel or make it less brittle. This also reduces hardness, so the maker wants to create the right balance - different tools get different tempers depending whats expected from them - ie an impact tool is tempered at a higher temp to let it down more so it doesn't shatter. Left dead hard after a quench, the blade would be too brittle - it could shatter if dropped sort of thing. Incidentally, this is what the japanese laminated cutting tools are all about - leave the inner tool steek very hard and use soft outer ducticle steel to give it strength. Carbon steel knives were not created for sushi. They predate any stainless knife which is essentially a perfermance compromise - not has hard a steel (which IS edge holding ability) but the don't rust. Anyway, maybe more than you wanted to know, but thats facts around the differences. Carbon steel is, as you've mentioned, a lot harder to maintain than stainless steel. However, carbon steel is a harder metal than stainless steel, meaning that it will be less vulnerable to the physical stress of everyday use and will hold an edge longer than stainless steel. As such, carbon steel knives are generally regarded as better for heavy or extended use in busy kitchens, as the chefs won't have to stop and hone their blades quite as often throughout the day. Stainless steel knives, on the other hand, are much more resistant to staining and corrosion, but they are harder to sharpen and will require more frequent sharpening overall than carbon steel knives. Each material has its pros and cons. In the end, you're really just trading one shortcoming for another—extra cleaning with carbon steel and extra sharpening with stainless steel—so the choice really just depends on what the knife will most often be used to do. If you frequently do a lot of hard chopping or slicing, investing in at least one quality carbon steel knife for heavy-duty applications may be a good idea. But if you're at home just cooking for your yourself or your family and will usually only need the knife for basic tasks and low-impact cuts, stainless steel will probably do just fine in most situations. Hope that helps, and good luck with any future knife shopping! Carbon steel is much cheaper than stainless steel although that isn't the only reason. I have a a few of each I don't k ow much about the science behind the making of them but personally I find I can get a super sharp edge on my carbon steel knives in no time at all which they hold well where as it takes me longer to get a no where near as sharp edge on my stainless steel knives and they don't hold it as long. This however could simply be my sharpening skills. Overall I find carbon much sharper and a lot nicer to use and I would always choose them over stainless but if I'm in a hurry I use a stainless. Personal preference I guess but I would recommend trying a carbon I got a small paring one to start and was so impressed I decided to splash not on a chefs knife. I have one of each - I do a lot of general prep work with my stainless but prefer the Carbon for dismembering cuts of meat. The sharper blade tends to cut through ligament and tendon easier. The high carbon steel knifes are self sharpening as much as they are rust prone. You may have to sharpen it under heavy use but on gentle use on veggies you'll eventually get an edge that will last a decade or more. As the edge wears sharp, will the sides. A thinner blade will result. My mother has been using these types of knifes for 80 years. Non-stainless alloys can be made with less (in percentage) alloying elements than stainless. An alloyed steel is not a homogenous, amorphous mixture of whatever is stirred into the melting pot; things can form coarse or fine structures very much dependent on the specifics of the smelting, forging (or rolling), and heat treatment processes. The more admixtures, the more complex it gets to get it right. 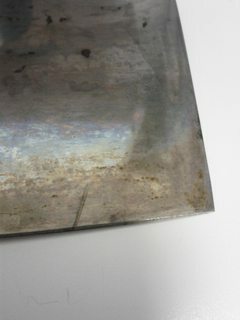 Unwanted coarse discontinuities, especially if they are not well attached and/or very hard and brittle or soft, make sharpening (or keeping an edge) precisely very hard because abrasives (or cutting medium) will have a different effect on these spots than on what is around them. At the same time, such spots in a controlled size can be welcome because they help stabilize the material. All a matter of balancing. The thing is, inexpensive stainless steels used in medium-priced cutlery ($30-$150 price range) are commonly of a type that due to these limitations does not reach the hardness or fineness that just using carbon steel will afford you. Also, somebody producing carbon steel cutlery can usually assume that his customers will expect his wares being dishwasher- or snap-proof, so he has no reason to further limit hardness/use a more conservative grind/edge, trading in sharpness/edge retention for robustness. *If you want to get a knife in VG steel, just look for any reputable but non-specialist retailer trying to sell you a damascus knife - chances are very high that you will end up with a VG steel knife. Unless you're considering going into Sushi preparation where a razor sharp edge to your knife is required I'd stick to the easy to maintain stainless steel knives. Carbon steel knives are primarily intended (but not exclusively) for sushi preparation. The Japanese are fanatical about sushi hence the whole carbon steel knife industry surrounding it. No surprise that the majority of the best carbon steel knives originate from Japan. Stick with stainless steel which is fine for all kitchen uses apart form sushi preparation. Not the answer you're looking for? Browse other questions tagged equipment knives stainless-steel carbon-steel or ask your own question. Are electric knives used in foodservice?